It has almost been a year since I first tried this pumpkin cornbread. I figured it deserved a re-post, because afterall - It is the first day of Fall today and what better way to welcome in Fall than with a pumpkin recipe! I LOVE this cornbread. I know it sounds really weird, but trust me, it works. I could really eat the entire pan by myself. 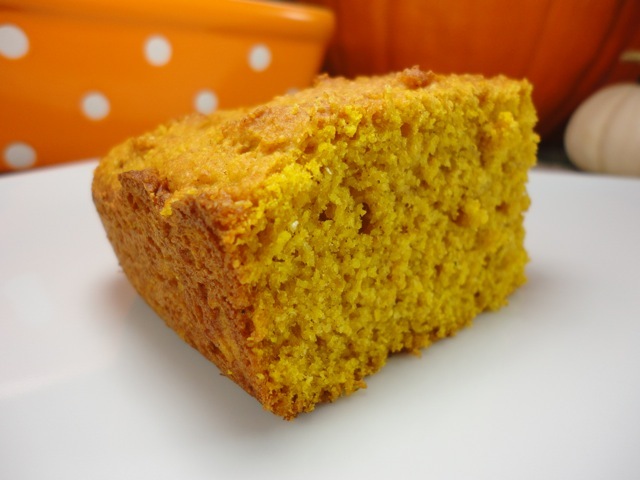 It has the texture of cornbread, but with a slight pumpkin flavor that is spiced with cinnamon and nutmeg. Fall would not be complete without making this bread at least a few times. Preheat oven to 400 degrees. Grease an 8x8 dish; set aside. Whisk together flour, baking powder, salt, cinnamon, nutmeg, brown sugar and cornmeal. In a small bowl, lightly beat the eggs. Stir in the pumpkin, oil and honey. Stir wet ingredients into dry ingredients until just combined. Pour batter into baking dish. Smooth out top. Bake 30 minutes or until toothpick comes out clean. Serve warm with honey. AMAZING! I am making this this week! Thank you! I love ANYTHING and EVERYTHING pumpkin. an't wait to try this recipe. Thanks for sharing. This look so yummy! Pinned it! Stopping by from Sew Can Do link party. pumpkin cornbread??! awesome, must try!